Do any of these apply to you: do you have naturally dry hair; coloured hair; use a flat and/or curling iron on a regular basis; blow-dry after every shampoo; just spent the summer by the beach and/or pool? If you feel concerned by one or several of these, or worse, all of them, then you might find yourself with straw-like hair at the moment. Although we appreciate the wild beachy hair look on holiday, a more polished look is often what we crave in our day-to-day life. Hair rehab starts here. No more holding out for a hero for your hair; he has arrived and he answers to L’Oréal Expert Fiberceutic Masque. This masque is nothing like you’ve ever experienced. Enriched with Intra-Cylane, a water-activated molecule that is able to deposit in the hair as evaporation takes place and is designed to help reinforce the protective layer of hair, Fiberceutic replenishes dry and extremely damaged, weak hair. Just as your skin would after botox treatment, your hair will be left feeling plump, and healthy, from root to end. The secret of this unique hair mask lies in Intra-Cylane, the exceptional molecule developed by L’Oréal, capable of penetrating to the core of each hair to create a flexible and resistant molecular network that fills out and strengthens the hair fiber. 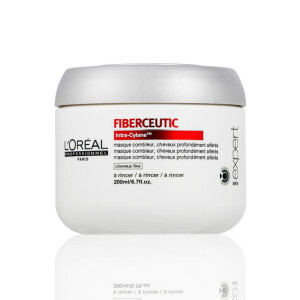 Fiberceutic does not just smooth the hair as some other masks might do, it works to reconstruct and strengthen locks but also protect them against further damage. Feel the difference: your hair feels softer and looks revitalised, shiny and just gorgeous! L’Oréal Expert Fiberceutic Masque is available at Taylor Hughes Hairdressing in two different versions: one especially designed for fine hair and one for thick hair. You can purchase both of them in the salon or via our online shop alongside the whole L’Oreal Expert Hair Care range.